Happy Friday! 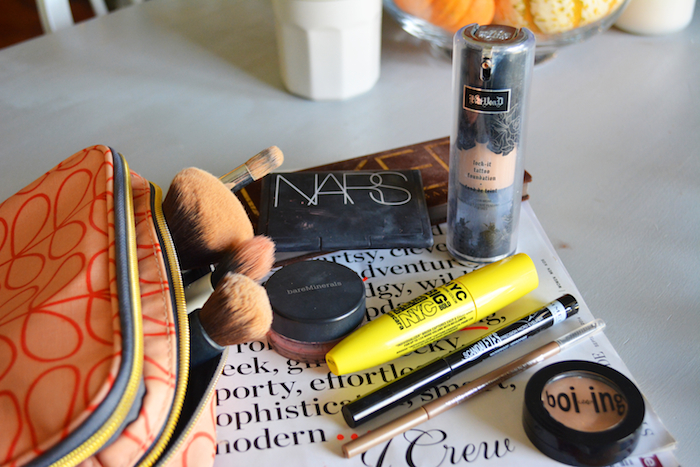 Today, I organized a fun little blogger collaboration to show you what's in our makeup bags! I'm no makeup guru, but I do love finding out what my friends and other bloggers use product-wise, because it helps me find new products that might work for me. In the last year I've started upgrading to nicer, more expensive makeup, and while the prices are a little hard to stomach at first, I promise the quality makes it so worth it! 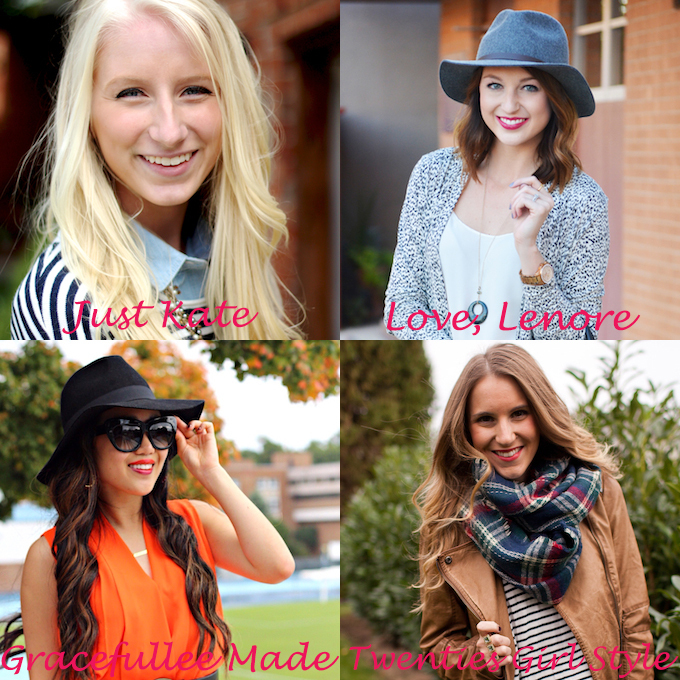 Please be sure to check out my friends' posts on Just Kate, Gracefullee Made and Twenties Girl Style! Benefit Stay Flawless 15-Hour Primer: I stupidly forgot to photograph my primer, but it's incredible and I will probably do a separate post soon on my foundation routine BUT... I can honestly say that it's the first primer I've noticed that makes a difference in how long my makeup lasts. Kat Von D Lock-It Tattoo Foundation in 'Light 48': I can finally say, after years and years of struggling with foundation that I've found one that lasts on my skin all day! I've tried tons of others, and this one has amazing coverage and lasts through my entire PR work day. Benefit Boi-ing Concealer in '01 Light': This concealer was a great recent find as well because it has good coverage without being cake-y on my dry skin. It blends beautifully too! Brushes: Sephora Collection Pro Airbrush Concealer Brush #57 and Sephora Collection Class Multitasker Brush #45. These two brushes have been complete game-changers for me. I apply both my foundation and concealer by patting on little splotches with my finger tip and then blending with these two brushes. Bare Minerals Blush in 'Secret': I love this mauve blush because it has some subtle plum undertones that work well with my skin tone and eye color, and because it's a loose powder it's super blendable. NARS Bronzing Powder in 'Laguna': This is also a pretty recent beauty find and one I will be keeping in my makeup routine for as long as I can imagine. It's a great subtle color that adds that nice color without being obvious that you're wearing bronzer, and it's very blendable. Brushes: IT for Ulta Airbrush Essential Bronzer #114 and Real Techniques Duo-Fiber Contour Brush from Ulta (not found online). My bronzer brush is huge and amazing, and 100% comparable to the Sephora brand one. My blush brush is old and I'm honestly just waiting until I can purchase a Sephora one. 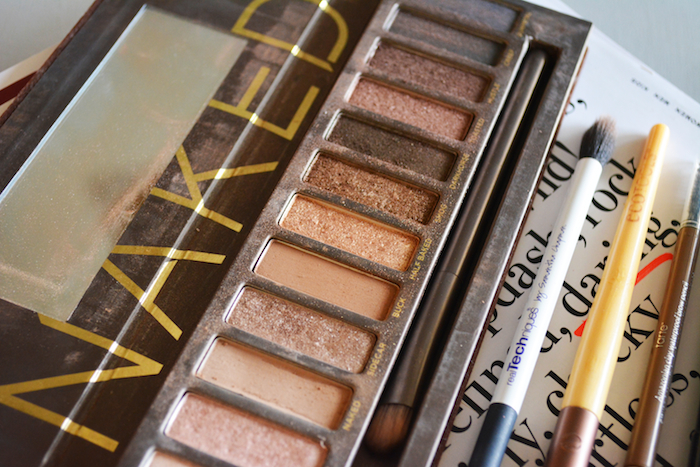 Urban Decay Naked Palette: This is a classic for a reason - it's amazing! I love all of the colors and they are actually completely wearable for daytime because the sparkle is subtle and the colors all layer and blend together so nicely. I was hesitant to spend $50 on eyeshadow, but it's 100% worth it because you get so many colors and they last forever! I've had mine over a year now (and use them pretty much every day) and you can hardly tell I've made a dent. NYC Big Bold Volume Mascara (purchased at Wal-mart): Mascara is something I do not splurge on and I try a new affordable one pretty much every time. I just bought this one and I'm not crazy about it, so I may go back to my $2.99 Jordana favorite from Walgreens. 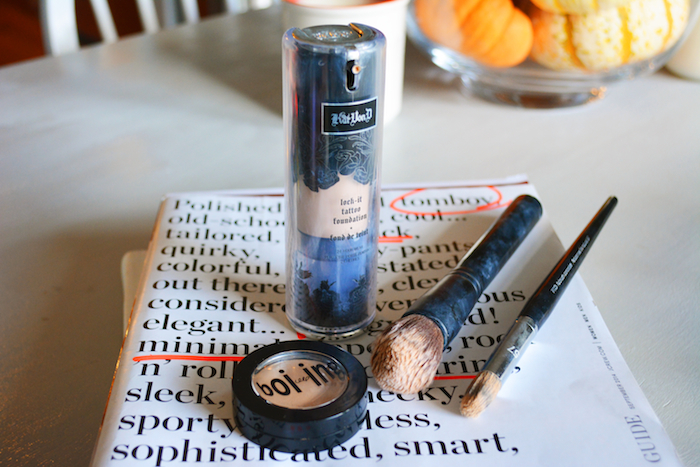 Rimmel Scandaleyes Precision Micro Eyeliner: This is new to me this week because I'm afraid my Loreal favorite has been discontinued. But it's pretty good! The application is awesome and very smooth with it and not too much comes out so you can build on it. However, it's not a super dark black so I don't know if I'll stick with it yet. 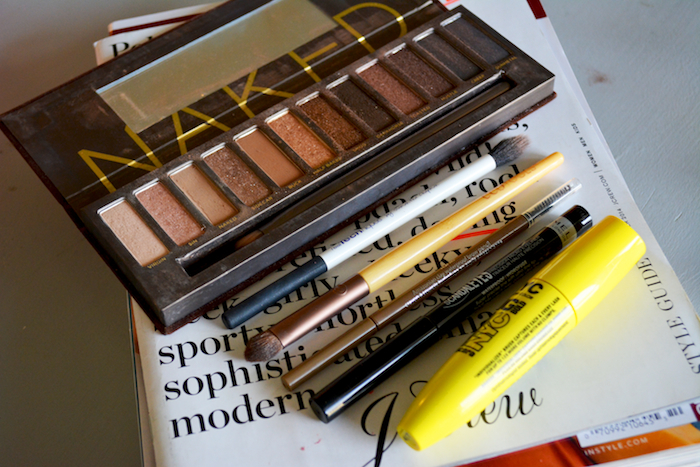 Tarte High Definition Eyebrow Pencil in 'Taupe': This is one of my best beauty finds of the past year! I never did anything to my eyebrows and didn't think I needed to because they were thick and dark. But this was a game-changer. It's still super natural looking, but I can define my arch and make my brows a much cleaner, defined look! I highly recommend this!! Brushes: Eco Tools Bamboo Shading Brush and Real Techniques brush for my crease. And that's my makeup routine! It's quite a few products, but it doesn't take me long and they all last all day long! I will probably do some posts in the future that break out my makeup more so I can go into more detail about application, but I think this is a fun start. 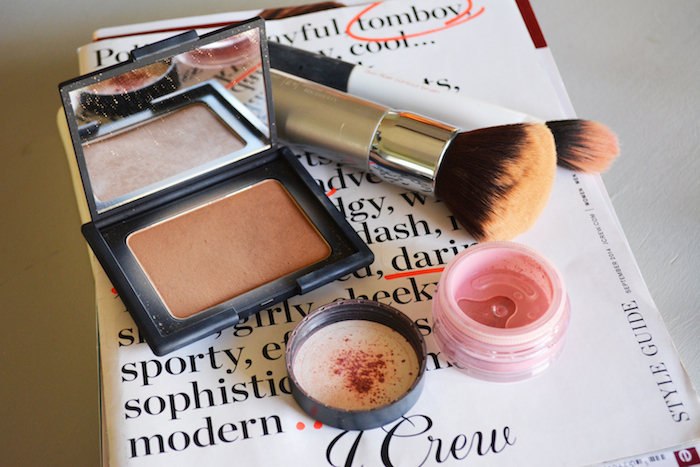 I hope you enjoyed our makeup posts today and that you have a great weekend! PS - Congratulations to my Johnston & Murphy bootie giveaway winner Aleah Helton! Thank you so much to everyone who entered and made it my most successful giveaway yet!